The lack of a Senate-confirmed ambassador can hamper the ability of the U.S. to conduct its diplomacy and maintain its influence in countries where embassy staffs are assigned to handle diplomatic affairs. According to the American Foreign Service Association, in at least 18 countries, including Egypt, Jordan, Qatar, Cuba, Honduras, Panama, and Brazil, the White House has not designated a nominee for Senate confirmation. Ambassador (Ret.) Barbara Bodine, Distinguished Professor in the Practice of Diplomacy at Georgetown University and former U.S. Ambassador to Yemen, says that not sending an ambassador sends a signal to a country that it is a lower priority for the U.S. Bodine added, “I just don’t think there’s a sense of urgency in the administration to fill these senior positions." “By not appointing an ambassador to a country, you are saying that this country is not important to us, its issues are not important enough to us, we don’t care about it, and we are not going to bother to send an ambassador,” Bodine said. The process has slowed down compared to past administrations. Two years into their presidencies, Barack Obama had 11 ambassador vacancies while George W. Bush had 15. Both the Middle East and Latin America are regions central to U.S. foreign policy interests. In a recent instance of this, the Trump administration cut funding last week to three Central American countries-- Guatemala, El Salvador, and Honduras-- in part because of their inability to stem dire economic circumstances that have led to migrants seeking asylum in the U.S.
Of the three countries, only Guatemala has a confirmed U.S. ambassador, a career diplomat. The Trump administration has nominated a political appointee for the ambassadorship to El Salvador but has not designated someone to serve in Honduras. In Mexico, with which the Trump administration is negotiating a trade deal and working on handling the flow of asylum seekers, the ambassadorship has been vacant for almost a year. Trump nominated political appointee Christopher Landau, the son of a career diplomat and a fluent Spanish speaker, for the post but he has not been confirmed by the Senate. Political appointees have been in the news recently, as a story first reported by NBC News revealed that at least 14 donors to the Trump inauguration have since received nominations for ambassadorships, with each donating an average of over $350,000 each. While political appointees have filled nearly half of the Trump administration’s ambassadorships, according to the American Foreign Service Association’s data, several Middle Eastern countries, including Saudi Arabia, have been without U.S. ambassadors for over two years. Trump did appoint a nominee in November 2018, however, selecting retired Army general and former commander of U.S. Central Command John Abizaid for the role. The United States sells more arms to oil-rich Saudi Arabia than any other country in 2018, according to data from the Stockholm International Peace Research Institute. 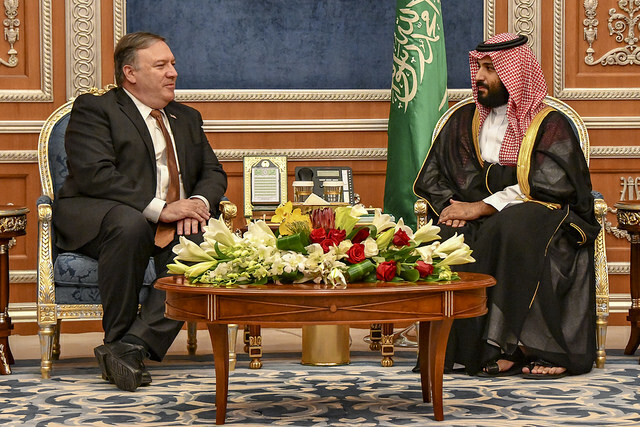 Riyadh was President Trump’s first stop on his first international trip as president and has been in the spotlight after the death of Washington Post journalist Jamal Khashoggi last year. Turkey, where Khashoggi was murdered, also has not had an ambassador since October 2017, but is awaiting the Senate confirmation of David Satterfield, a career Foreign Service officer, who was nominated in February. No one is nominated to fill the Ambassador post in Jordan - traditionally a strategic ally in the Middle East- and the position has been open since the day of Trump’s inauguration. In Libya, where former Ambassador Christopher Stevens was killed in the American consulate in Benghazi in 2012, there has also been no ambassador nominated in over two years. The last Senate-confirmed ambassador to Libya, Peter Bodde, came out of retirement in November 2018 to serve as Chargé d’Affaires, the official second-in-command and de facto ambassador because no one has been confirmed. The State Department, when reached for comment, referred questions on ambassadorial appointments and nominees to the White House. The White House then referred the same questions to the State Department for comment. For a full list of ambassadorial appointments and vacancies, click here for a list from the American Foreign Service Association. Trump administration officials sought to bus detained immigrants to so-called sanctuary cities as a way to retaliate against the president’s adversaries, officials confirmed Thursday. 9 min 39 sec ago. 14 min 19 sec ago. 14 min 47 sec ago. 22 min 54 sec ago. 22 min 58 sec ago.